Go to Camiguin! “THE Philippines is not only Boracay, it’s not only Baguio, it’s not only Cebu, but there’s a small place where people are so warm, friendly and hospitable; where the air is so fresh it even cleanses your spirit; it’s the best place to unwind! This was the statement of Regional Director Catalino A. Chan III of the Department of Tourism, Region 10, as he invited everyone to spend summer in Camiguin, the region’s top eco-tourist destination, during the recent “Tourism Forum” in Mambajao, the capital town. Chan proudly announced that the island-province of Camiguin Philippines was recently declared as having one of the best beaches in the country, in addition to being one of the most peaceful and serene locations in the country. Aside from this distinction, Chan said, the island was recently proclaimed as the 6th best dive site in Asia and is recognized as one of the top 10 domestic destinations. “This is because other than its beautiful beaches and tourist spots, local officials are working to protect the environment and maintain its peacefulness. In fact tourists can walk around the island in the evening without hesitation,” Director Chan said, adding that Camiguin’s peace and order condition has remained relatively stable and conducive to tourism over the years. Camiguin: "Island Born of Fire"
• The Sunken Cemetery is marked by a large white cross which was swept into the sea by Old Vulcan Daan's eruption in 1871. From here it is a perfect place to watch the glorious sunset over the ocean. • Katibawasan Falls is a beautiful, clear stream of water cascading 70 meters into a rock pool surrounded by ground orchids, wild ferns, trees and boulders. • Tuasan Falls: The approach to the wild and mighty falls entails a very scenic hike passing through the quaint area of Mainit, Catarman and along the rocky river bed. • Ardent Hot Spring is a mineral pool that bubbles in the heart of the island with water around 400C. Wonderful for bathing in at night surrounded by cool mountain air. • Sto. 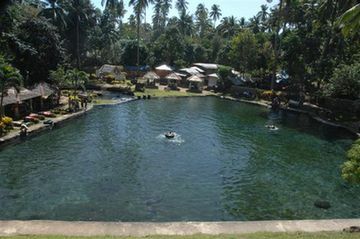 Niño Cold Spring is a spring located 4 kilometers north uphill of Catarman proper. It has a terrific huge pool of cold spring water measuring 25m x 40m sprouting from its sandy bottom. • White Island is an uninhabited white sandbar with a view of towering Mt. Hibok-Hibok and Old Volcan. It is reached within 10 minutes via outrigger boat.